"This work had to be done right. Period," said Mark Italiano, project manager for the AOC's House Superintendent's Office, as he described how in less than four weeks, a dedicated team of tradecrafts experts was able to transform Room 104 in the Cannon House Office Building into a completely wheelchair-accessible office suite. The office suite was being prepared for Member-Elect Tammy Duckworth of Illinois, a veteran of the Iraq War, who in 2004 lost both legs and part of the use of her right arm when the helicopter she was piloting was hit by a rocket-propelled grenade. Kevin Hildebrand, head of the Architecture Branch, met with Duckworth when she was in Washington, D.C. for new member orientation. "She was such a gracious person," he said, noting that she requested that the entire office suite be made ADA accessible, not just her personal office, since she anticipates many visits from wounded veterans. "We had to be diligent in ensuring that everything met ADA requirements." 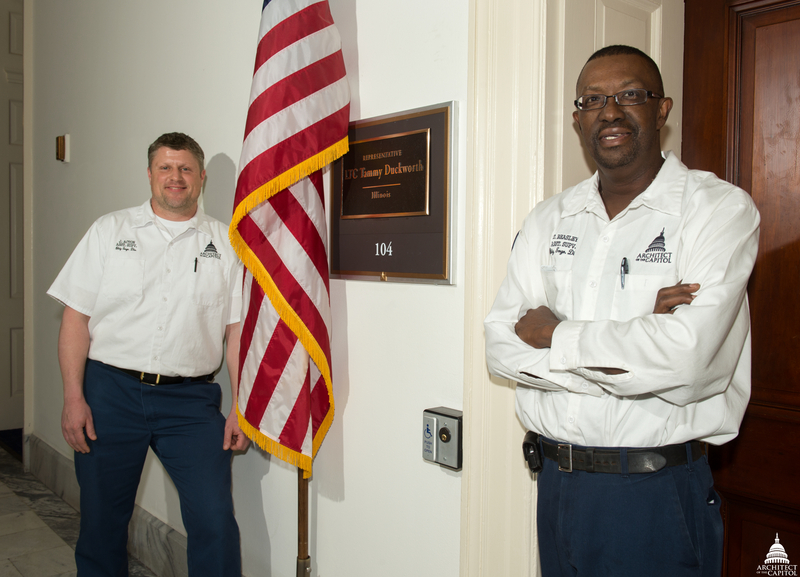 Jeremy Acton and Thomas Beasley are just a few of the AOC employees who worked on renovating Representative Duckworth’s office. The time after an election is an incredibly busy period for the House Superintendent, who coordinates the office moves of new members as well as incumbent members who choose to move offices. "This was a good example of a project where everyone pitched in — the AOC's Construction Division, House Superintendent's shops and even the Capitol Superintendent's carpentry shop — because we knew it had to get done," Italiano said. Changes to Duckworth's office included new designs for the member office and restroom, reception area and staff office space. "One of the challenges was having to produce drawings as construction was happening," said Hildebrand. "After meeting to determine what could be produced in our shops, we came up with a plan that included tapping the resources of the Construction Division," Italiano said. The Construction Division, under the umbrella of the Project and Planning Management Division, is a round-the-clock operation that is available to assist all AOCjurisdictions. For this project, the Construction Division provided skilled hazardous materials removal workers, electricians, carpenters, plasterers, painters and a plumber. "When another jurisdiction needs help, we are here to serve," explained Ron Riley, operations manager for the Construction Division. "That's what we do." The condensed timeframe required precise planning and coordination efforts. "We were working pretty much elbow to elbow with the other trades," said Steve Clark, pipefitter leader for the House Superintendent. Clark and a crew of plumbers worked on the restroom plumbing, which had to be shifted three feet from its original location. In order to be ADA compliant, the restroom itself grew from 16 square feet to 100 square feet, and used space that was part of the member's office. "The ADA requirements are quite specific, so we had to hit precise measurements." ADA requirements included installing automatic operators on all of the office doors. To save space, the door from the restroom to the member's office became a pocket door that would slide into a hidden pocket, thereby decreasing the number of swing doors in the space. Jeff Hagan sands a door in the Capitol Superintendent’s carpentry shop. 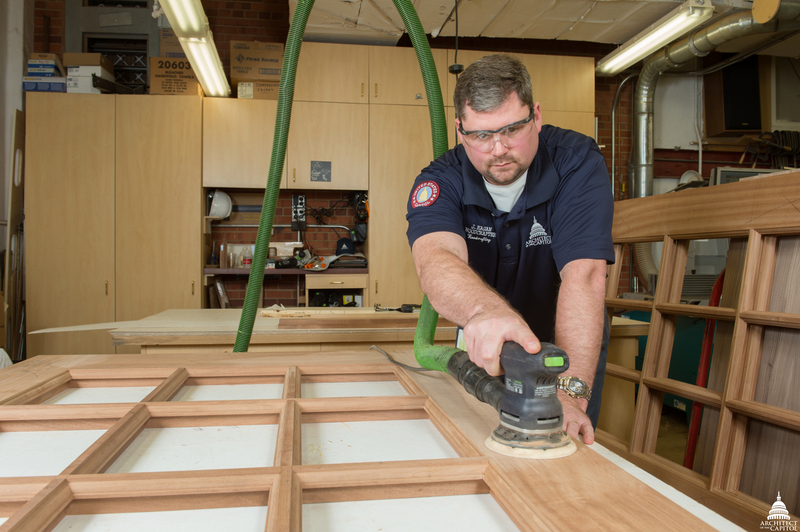 With congressional office moves in full swing, the House Superintendent's carpentry shop was already stretched thin so the Capitol Superintendent's carpentry shop pitched in to make the new pocket door. After getting the necessary approvals, Hildebrand delivered the door specifications to the employees of the Capitol Superintendent carpentry shop, who were more than willing to assist. "We're set up to make these types of doors pretty quickly," explained Pete Meneghini, woodcrafter supervisor for the Capitol Superintendent. Crafted out of mahogany, the door was made seven inches wider to allow access to the door's special ADA-compliant hardware. "We built it in five days, which is standard for us," said Capitol Superintendent Woodcrafter Jeff Hagan, who crafted the door. "It was a team effort," Meneghini added. "We had the equipment and material to make it happen." Hildebrand was very pleased with the carpentry shop's efficiency. "I had barely given them the sketch and it seemed like they were already finished fabricating it." With the help of the AOC's Capitol Superintendent carpentry shop and Construction Division, the House Superintendent was able to finish the office before the start of the 113th Congress on January 3, 2013. "The work was done on time, efficiently and cost-effectively," Italiano said. Mark Italiano speaks with a staffer from Representative Duckworth's office. "I deeply appreciate the commitment that the employees of the Architect of the Capitol have made in making my office handicap accessible," said Representative Duckworth. "It was very important to me that members of my staff and my constituents with disabilities felt that my office was accessible and the work of the Architect of the Capitol has made an enormous difference. All Americans with disabilities should have the opportunity to work in an office that is as accessible as Cannon 104." Paul Blaylock, the Construction Division field supervisor who was on-site every day during the project, added: "We felt a lot of pride doing this for the congresswoman, especially with all she's done for our country. The guys thought it was pretty neat."